The other day Will and I decided to drive 3.5 hours south of Phoenix to Bisbee, AZ after a family friend told us about the really neat mine tour down there. We thought it sounded pretty fun, would make a great little day trip, and would be a great way to test out the new camera. *Edit: people have been asking about the camera: it's a Canon 6D). 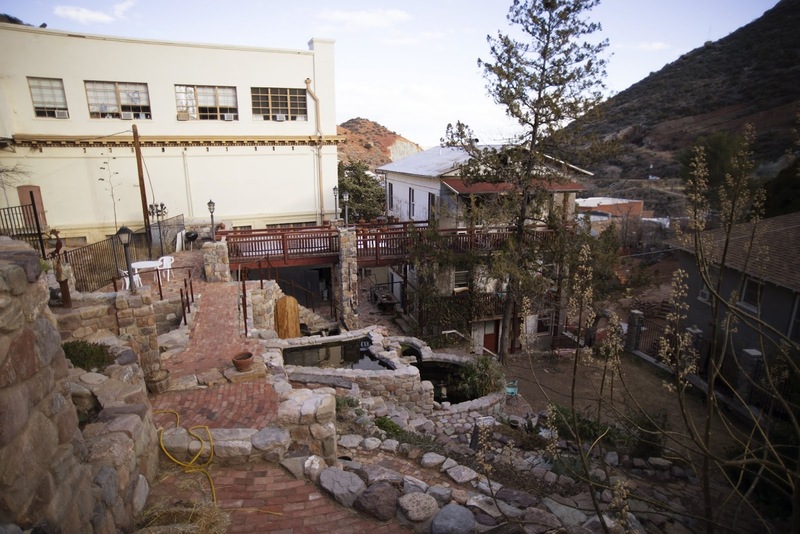 Bisbee is an old mining town turned to a little artisin community, with lots of cute little cafes and antique shops. There were stairs that just took you up the side of a mountain. I'm not going to lie, by the time we got to the top of them I was feeling it in my poor legs (I think that might be a sign I need to hit the gym a lot more, haha!) 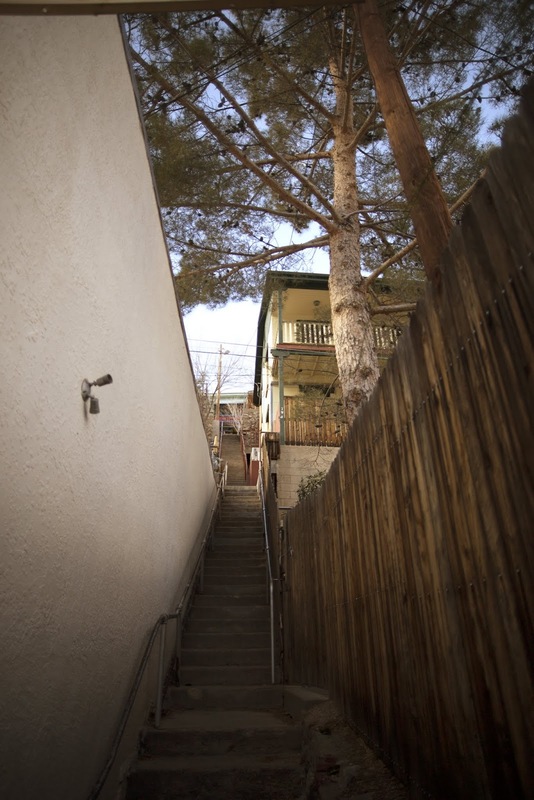 The stairs went to the back yards of a lot of houses, it is one of the ways people use to get down onto the main street quickly. This was in someones back yard. We weren't being creepers I swear, you could look in as you were walking up the stairs and it was too pretty not to take a picture. I love how the house has a little walk way from the third story to the seating area. I would love to have something like this in my backyard. Maybe one day. 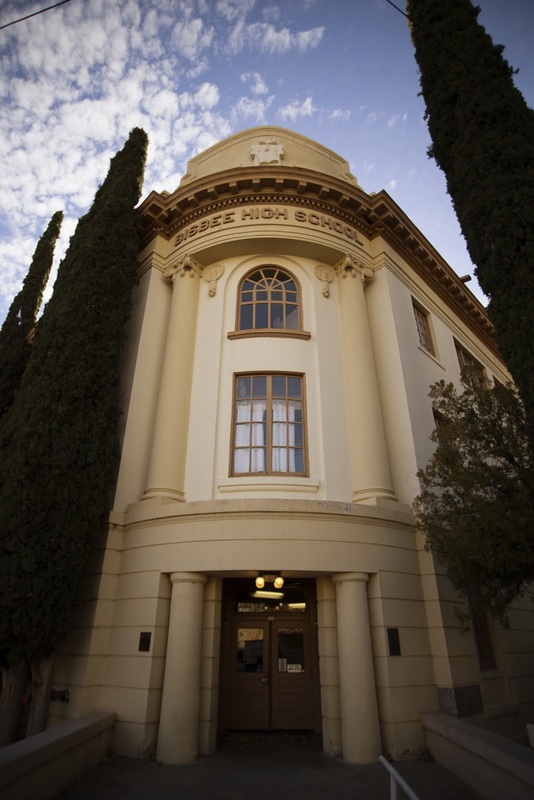 I have to admit this is probably the coolest looking high school building I have ever seen. I really wish we could have gone inside to see what it looked like. We would have loved to explore a little more, but it was so darn cold! I looked up the weather the night before and it said it was going to be high 50s, but it ended up being extremely windy and more like high 30s, brrrr! I guess next time I will make sure to check the weather before we leave in the morning hehe. But we still had a great time, and Will put together this great little video of our adventures! Have you guys ever done a mine or cave tour? If so how'd you like it? I hope everyone is having a lovely Wednesday! I love that back yard! That's so beautiful. I also love that building! How gorgeous! Love the video-- I really need to try to take more vids, yours are always so awesome! wow! what a great day trip! The architecture is what gets me. You don't see that on the East coast. Beautiful photos! Looks like a great place to visit, I've never been even close to Arizona before. I need to get out more and visit lovely places like this! I've never done a mine or cave tour, but it looks like you had fun! I always envision having to army crawl through spaces barely passable, squeezing through cracks and it makes me not want to go, but I think I could handle a train ride! :) cute video! That looks awesome! I've never done a real tour but I went to a cave the other day and it was awesome! That video is so awesome!! And romantic, aww :) Thanks for sharing! Yay for Arizona, it's where I live! 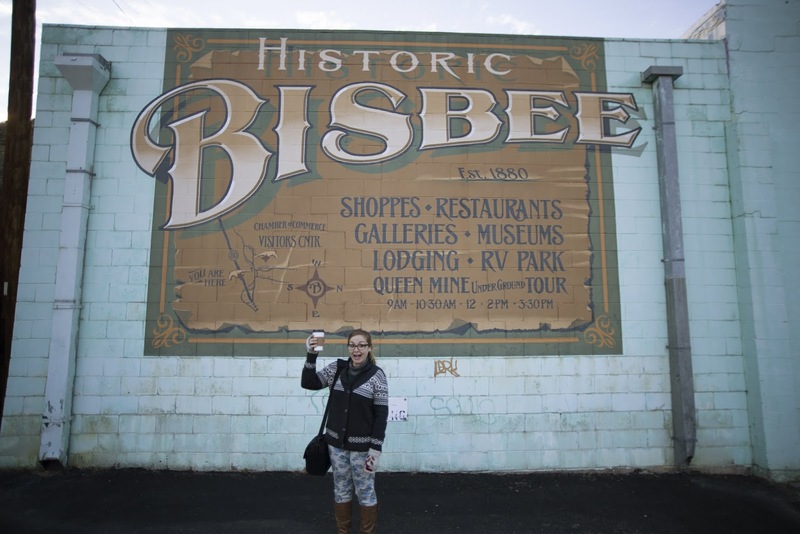 I love Bisbee, it's so adorable. There are so many little mine towns like that that have turned into little tourist places. I've never thought of doing a mine tour though. I'll have to check it out next time we're near one! that high school does look so wonderful! it is a lot nicer looking than mine was! the photographs are so pretty. That looks like an interesting place. Super adorable photos of it! I've never been on a mine or cave tour, sounds a little... scary (cave ins scare me!). I've done underground city tours though, and those weren't scary. 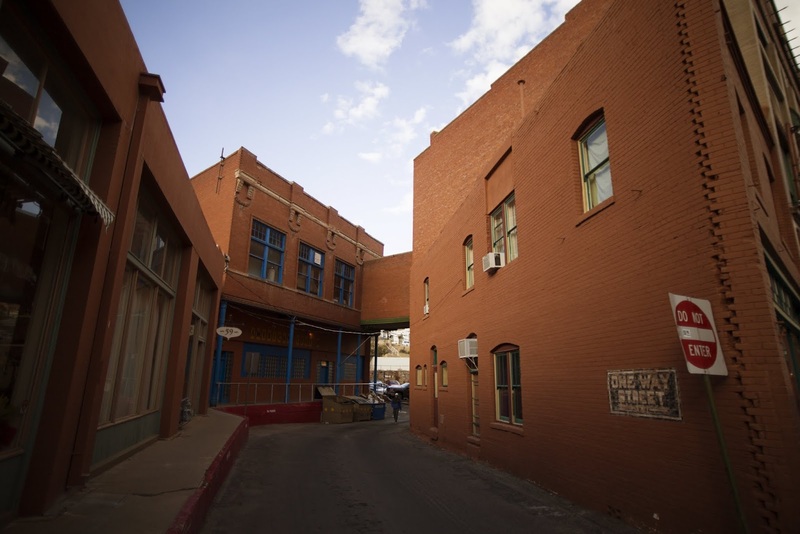 So this post came up as a suggestion as I was looking at your xmas illustration- I LOVE Bisbee. And it's funny because we spent New Year's down there last year which I see this post is from about that time- wonder if we were there at the same time! It actually snowed like 6" there the night before NYE!